Olentangy Liberty’s Ben Roderick, right, makes a move against Newark’s Keshawn Heard during the first half of Tuesday’s non-league showdown in Powell. 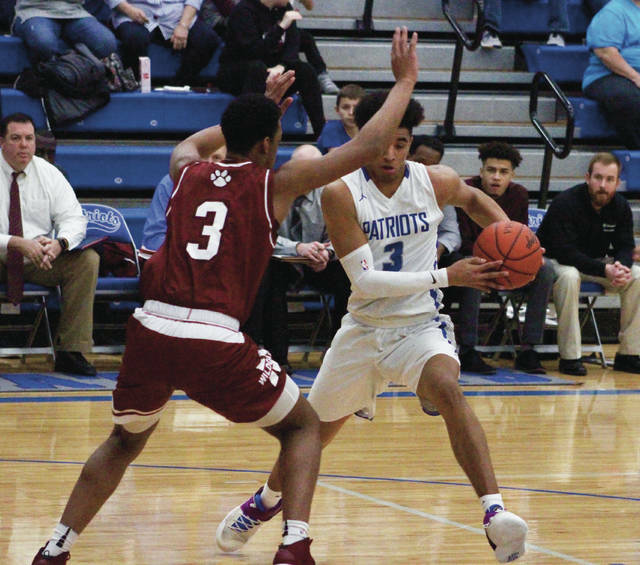 POWELL – Senior Joey Thatcher knocked down three 3-pointers to lead a 29-12 first-quarter onslaught and the Olentangy Liberty boys basketball team cruised to a 68-45 win over Newark in non-league play Tuesday night. The Patriots, who trailed 4-3 early, knocked down six 3s in the first quarter alone and finished with 13 for the game by seven different players. Thatcher has been doing it all season. His four pushes him to 34 for the season. He was leading the area at 54.5 percent coming into Tuesday’s game. He said he benefits from having defenses focus their attention on Ben Roderick. Roderick, meanwhile, had his lowest scoring output of the season with a team-high 15 points. But he added five rebounds, four assists and four steals to his stat line to help Liberty to its fifth straight win. Nick Nakasian had 12 points and Mitchell Kershner added 10 and six rebounds for the Patriots (15-4) in his return to the starting lineup. Kershner scored seven points Friday night at Westerville North in his first game back since Dec. 21 (toe). His injury was thought to have been season-ending. “With Kersh back – it’s another shooter, another back-cutter,” Nossaman said. Keshawn Heard scored 14 of his game-high 16 points in the second half and finished with four rebounds to lead the Wildcats (15-4). Kade Bafford added 11 points, including seven in the first half for Newark. “This is one that you’re going to want to look at because if you want to win a district title or win the league, you’re going to have to beat teams as good as Olentangy Liberty,” Quackenbush said. Next up, Liberty can clinch at least a share of the OCC-Buckeye championship with a win over Westerville Central Friday night in Powell. Tip-off is scheduled for 7:30 p.m.